It's been five years since THE OCEAN's last LP, and three since the group appeared on the "Transcendental" split EP with MONO. 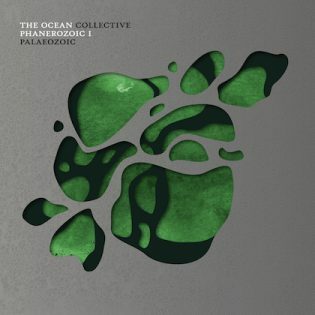 Brainiac post-metalheads rejoice, for THE OCEAN COLLECTIVE (best known simply as THE OCEAN) is back, releasing the first of a proposed two-album project, "Phanerozoic", intended to drop conceptually between 2007's "Precambrian" and 2010's "Heliocentric/Anthropocentric". With ISIS laid down and the long wait for new PELICAN material, THE OCEAN—alongside NEUROSIS, LONG DISTANCE CALLING and ROSETTA—serves to give starving drone-sludge academics their fix. Chronologically superseding the Precambrian age, the mass extinction eon, Phanerozoic, is also believed to be one of the Earth's most significant ecological diffusion periods. If you've been following Robin Staps and THE OCEAN's tomes of didactic metal, then you can safely assume the first installment of "Phanerozoic", "Palaeozoic", posits mankind as a propagating factor to global devastation and nature's harsh responsive reconstruction. As THE OCEAN COLLECTIVE, Staps's ever-changing roster is bound to lumbering through a certain mid-tempo slog from album-to-album. For this one, Staps invited his lighting designer, Peter Voigtmann, to contribute to the instrumentation while integrating new drummer Paul Seidel and bassist Mattias Hägerstrand. The album's biggest highlight, however, is a guest appearance by KATATONIA's Jonas Renkse on "Devonian: Nascent". What "Palaeozoic" may lack in rhythm dynamics is well compensated for by a sophisticated compression of the album's constant grimness, flowered with restful keys, echoing guitar patters, horns and cello. All brought into progressive, if often blaring bliss, particularly on "Silurian: Age of Scorpions" and "Devonian: Nascent". Jonas Renkse is a classy voice of conscience to offset Loïc Rossetti's prolonged hollering. Rossetti's mastery of hard-clean swaps, however, gives "Palaeozoic" added refinement. Reflecting the garish permafrost of a reputed 95% extinction event, the haunted eulogy "Permian: The Great Dying" closes the first section of "Phanerozoic", leaving in its glacial wake questions about our planet's changing bionetwork. Are we bound for a real-life "Day After Tomorrow" cataclysm, prompting continental shift and population readjustment? Or is our pervading fear of global warming the Earth's future fate? As heavy a prospect to consume as the album itself.